Ridiculous training videos have been a huge source of entertainment for me lately. The danger and flamboyance in this particular video is startling. 0:57 to 1:19 seems like it would be better suited for an SNL skit. It’s amazing no one shot the cameraman, or themselves. I suppose understanding the context of this video and the one linked would be too much to ask. Especially in the linked video. Basically, here they pretend they are action heroes. It’s the equivalent to the Star Wars kid. 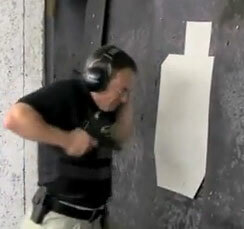 Ya notice that the instructor is wearing a bullet proof vest and there is probably a reason for it!!! Punch with a loaded gun hahahahahah!!!!! wow, what was the point from 1:09-1:12? how many times they could sweep each other? LOL! I was thinking the same thing! Love the Synchronized CQB at 1:07. I give them a 9 … would have been a 10 if they threw they swapped guns in midair. Amateurs. Agreed. They’ve obviously never been in a up close brawl. I’ve seen middle age women’s boxing classes move faster and hit harder. I hope the CIA made that video to confuse Al Qaeda instructors. HA! I totally thought that too. GUN KATA! For when you need to stand in one position and never EVER get shot. Looks like someone watched Equilibrium one too many times. Scary thing is, there are many that will take this completely seriously. I assumed they were using simunitions. No? I love the use of the long mag and “sprinkler” attack at 1:47. I was disappointed to not see any bumpfiring. In a close quarters self defense situation, adjusting your ear muffs is key to survival. Anything to do with the CAR system, like these dudes, is a total joke. Well, that was interesting. I guess. Pima County SWAT should hire these guys. LOL. It is like that stupid Israeli practice of carrying a pistol without a round in the chamber and doing that exaggerated draw and slide maneuver. Stupid and a waste of time. Synchronized Shooting. Coming soon to the next olympics. Perfect example of what not to do. I’m going to use this in a training class! You think anyone ever watched Equilibrium and decide to make a training video? Take a look at the mag in the closer-guy’s magwell around 1:10-1:15 – it’s SAFETY BLUE (e.g. “Inert”). And yet he’s firing rounds out of it. Anyone else see something fundamentally wrong with that? And yeah, serious GUN KATA here…. Yes, there was something fundamentally wrong with that. Among other things… lol. Because NFA laws are applicable to Europeans, right? One thing I didn’t get was at 1:30 or so, during those reloading drills. The foreground guy drops a mag, slide still forward, loads in a new mag, and then racks the slide. One would think that this ULTRA TACTICAL SCHOOL OF TACTICAL COMBAT OPERATIONS would have taught them to not waste rounds. The stupidity amazes me. Reminds me of the folks I saw shooting at a Tenessee range that had been “trained” by a martial arts “expert” to use the edge of their slide to aim instead of sights. They held their guns cocked at a 45 degree angle when firing.